I like zucchini! I like zucchini cooked in every possible way, even just boiled with a little olive oil, salt and lemon. It is one of the most common summer vegetables with endless ways of cooking. It can be easily used in a light and healthy side dish or in a most complex and delightful main dish. Its sweet and distinctive flavor can be combined with a big variety of products creating real appetizing meals. It is almost a paradox that such a cheap and common ingredient can be the reason for great dishes. 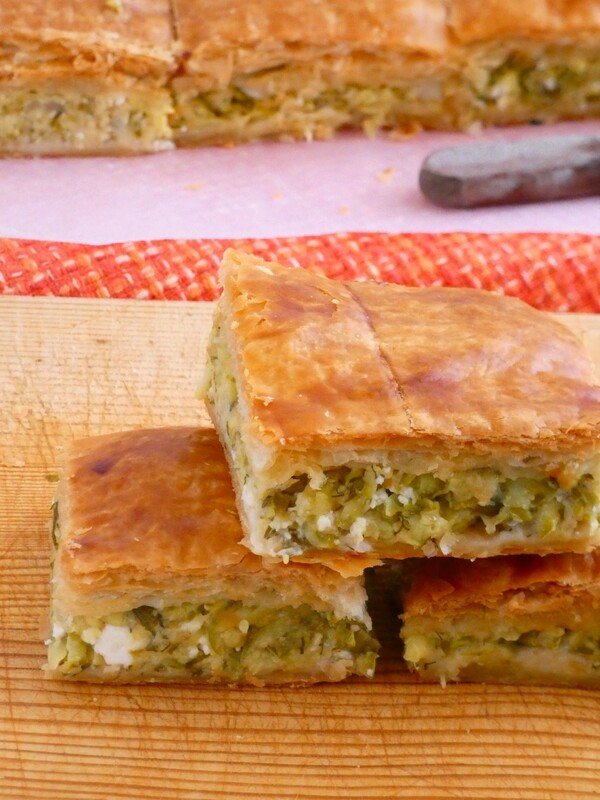 No doubt zucchini pie with feta cheese is one of those great dishes! Pies are always a good idea for a family meal. 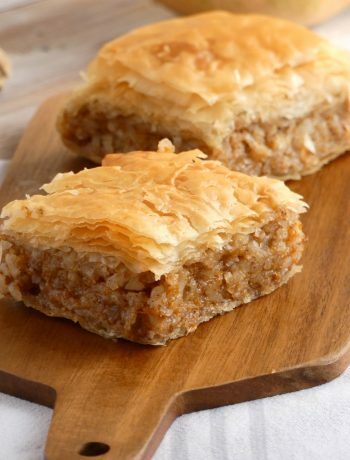 They are easy to make (most of them), they are a complete and satisfying meal, most children like them and you can take a piece at the office the next day or have one as a snack in the afternoon. 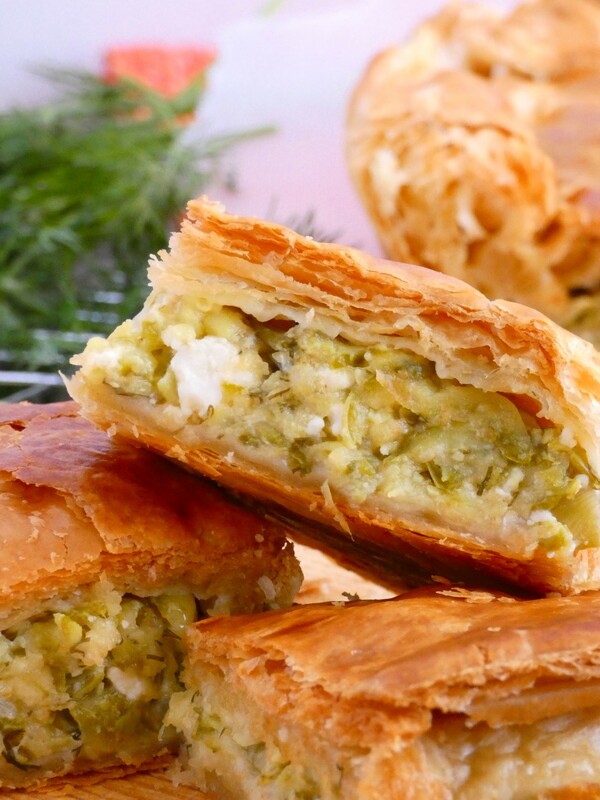 In order to make zucchini pie with feta you will need simple to find and low budget ingredients. 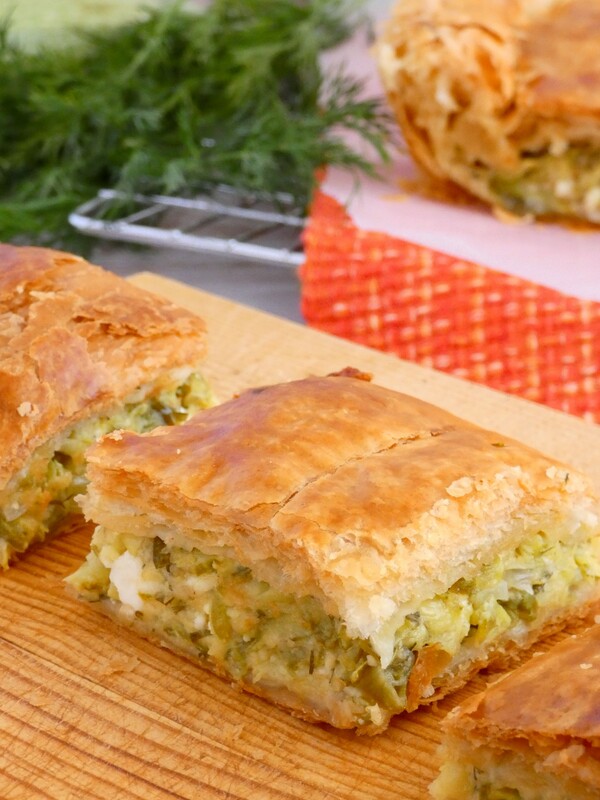 Puff pastry, zucchini, herbs, onions and cheese. Nothing fancy! A sheet of puff pastry at the bottom, filling in the middle and a second puff pastry sheet on the top. Easy! You will not believe how incredibly tasty that pie is! 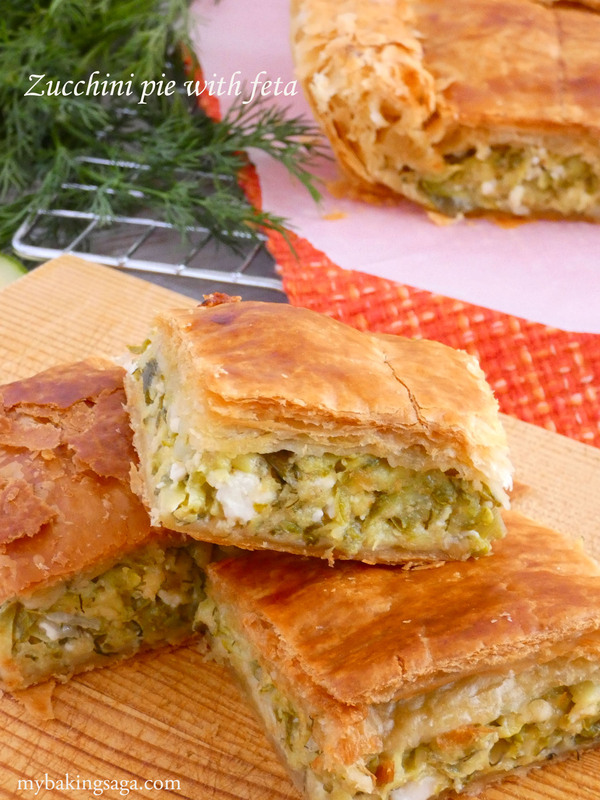 The soft, buttery and melt in your mouth dough, the spicy cheeses and the freshness of zucchini and herbs I think is a good enough reason to give it a try! Wash the vegetables very well. Grate the zucchini on the largest holes of a grater. Place the grated zucchini in a colander and sprinkle with salt. Mix and squeeze with your hands to remove as much liquid as you can and let strain for about an hour. After an hour squeeze again very well to remove all the liquid that may still exist and place the zucchini in a big bowl. Add the spring onions, the onion, the dill, the cheeses and the olive oil. Season with salt, mix very well with a spatula to incorporate and set aside. 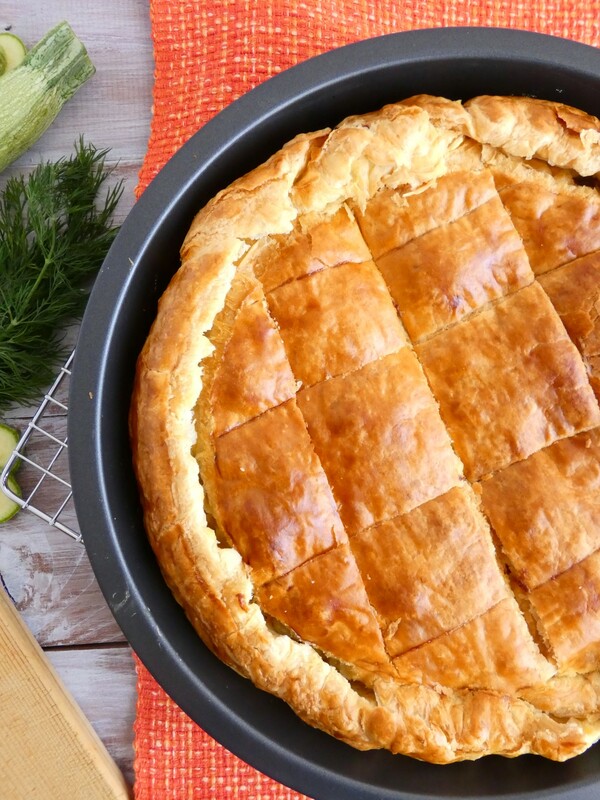 Grease a 26cm round baking pan with olive oil. Place one sheet of puff pastry on the bottom and the sides of the baking pan. Add the zucchini filling and spread evenly. Cover with the second puff pastry sheet. Cut off the puff pastry that hangs outside the pan. Seal the pie by pressing the edges together with your fingers and gently fold them in to create a kind of "wreath" around the baking pan. Score the top of the pie into pieces and brush with egg wash.
With a knife make two or three slits for the steam to come out. Bake in a preheated oven at 175°C for 55 minutes.